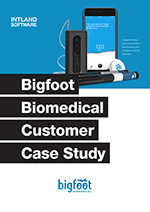 Bigfoot Biomedical is a fast-growing Silicon Valley-based medical technology startup that uses lean Agile processes to build an innovative product ecosystem. This case study explores how they use codeBeamer ALM to facilitate complex medtech development processes with the aim to ease the burden of managing diabetes care. In a bottom-up initiative led by fathers of children with Type 1 Diabetes, Bigfoot is developing products that have the potential to create a revolutionary shift in the everyday lives of patients living with the disease. Their investigational systems in development include a connected glucose sensor, an AI-backed insulin pump with a proprietary control algorithm, and a connected insulin pen-based decision support system. Since 2016, Bigfoot Biomedical has been using codeBeamer ALM as part of their Quality Management System to support development and compliance with relevant medical regulations. This case study describes Bigfoot’s process of transitioning from their old toolchain to a cutting-edge ALM platform that provides traceability, process maturity, and compliance support across the lifecycle.